This morning, as this post is being published I’ll be starting the 19th Rome marathon, together with my friends Serna, Manuel and brother Jaime. I am very satisfied with the way I could train towards this marathon, no injuries this time. 5 days of tough series training: 12x400m, 14x400m, 8x800m, 9x800m and 10x800m. 7 long runs of over 16km each, 4 of them over 20km. 5 races: San Silvestre Vallecana (10km), Course des Rois (10km), Le Deca d’Escalquens (10km), Trailhounet (18km) and Media Maratón de La Latina (21km). 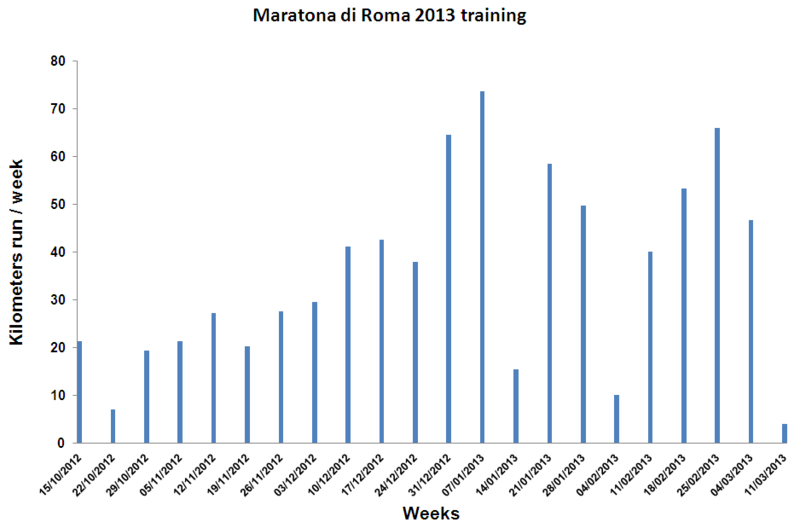 Maratona di Roma 2013 training season. Kilometres run per week. A lesson learned from previous training sessions: when I noticed that some muscle or tendon was getting sore from too much training I did not hesitate in slowing down that week, instead of keeping up with the training until getting seriously injured. Let’s see today how it goes, anyway, as Jaime says, it’ll sure be a day for the epic :-).